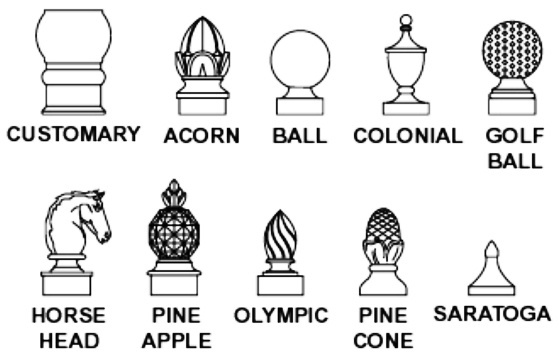 We have a wide selection of finials for 2 and 3 inch diameter round signposts. These are black powder coated, and fit on the top of the round post. This section of Gallery 17 shows custom signs and posts. Over 100 more steel and aluminum posts, bases, finials, scroll brackets and other mounting brackets are shown in Gallery 4, to see them please click on Gallery 4 - Sign Posts and Scroll Brackets.